...the redneck eats well, here are some of our favourite tried and tested recipes. My last trial of this mooncake was back in 2006. Yes, it took me a good 2 years to get over the 'trauma' and give this another go. Not a mooncake for the fainthearted to attempt. What is tedious is sealing the dough without destroying the spiral pattern. But the end result is very rewarding. The pastry is very very crispy, crunchy and light. Apparently the secret to getting the mooncake to bloom like a snail shell....'dunking it in very hot oil 3 times'. The traditional filling for this is yam but there is nothing to stop you from putting your own spin into this by using a lotus or bean paste or whatever takes your fancy. Hence I am not putting a recipe here for the filling. Mr Redneck likes his with a savoury mung bean filling.
. Rub shortening with flour until it looks like breadcrumbs.
. Add in water and sugar and mix together to form a smooth dough. Cover and rest for 30 mins.
. Divide dough into 2 pieces.
. Rub shortening gradually into the flour to form a soft dough. Cover to rest for 30 minutes. 3. Wrap oil dough into water dough and flatten. 4. Roll out into a longish flat thin piece. Roll up like a swiss roll. 5. Turn 90deg and repeat step 4. For photo aid, look here. It is similar to the rolling of pastry for Seremban Siu Pau. 6. Cut each roll into 3 equal pieces with a sharp knife. 7. With the spiral side facing down, flatten and roll. Wrap with filling of choice. 8. Heat a pot of oil on high heat. Dunk the mooncake in 3 times in very hot oil. Reduce to medium heat and deepfry till golden brown or bake at 180C for 10-20 minutes until pastry is cooked. These mooncake cannot be kept for long and should be eaten within 2-3 days. 1. When rolling into a round, roll the edges of the dough thinner to make it easier to seal. 2. If your shortening is hard, soften it in the microwave before using. Wow! I've never seen these before but they look gorgeous! Gorgeous!!! I'm so glad you gave it another try. I am always amazed when I bite into one of these - I love the way tho whole thing crumbles. That looks great ! I like the shape ! I should give it a try. Looks amazing. I've never tried this and wish I could! this looks amazing! well done! Hi I am really amazed by your blog, I checked your profile, you're from NZ, but the things you make are so Malaysian in origin, any responses to that? I was thinking of linking your blog to mine, is that alright? my blog is archicooksjournal.blogspot.com, I am a greenhorn in this but I really enjoy culinary arts and blogging about it. Archicook, I am a Malaysian in origin. You are most welcome to link to my blog. Thanks for dropping by. Skinnycook, staring is good...no need to worry about weight gain lol. A sifu had taught me over a week how to do this spiral thing but it is very complicated & I still can't master it. Not many ppl can do it. So many steps & rules to follow when folding it. U r like a superwoman to me..can look after yr huge garden, animals, hubby & household with all those special cooked food! How u do it?? Salute u.
ha..ha.. superwoman indeed! You have given me such a tall hat to wear. What if I were to tell you I don't cook everyday except for vegetables. When I do cook, I cook in bulk and freeze, saving me lots of time to do other things. Oops....I just realised I called you skinnycook. Sorry ! love your blog...really inspiring!!! will have to try this recipe...thanks for sharing your cooking adventures!! Hi! You've had so great recipes. I'm impressed with your videos and the way you present your food. 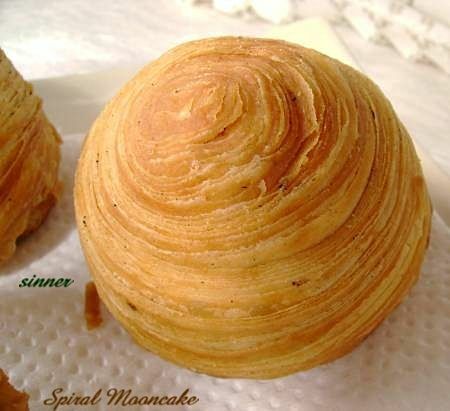 It would be so wonderful to get a video of the Spiral Mooncake as I've made a disastorstory out of mine <__< (I thought I sealed it right but when I dunked the mooncake in oil the seals open revealing the filling and the rest is popping hot oil O_O) Oh and thanks again for the wonderful recipes! I too find the sealing of this mooncake to be the most tricky. The sealing is quite similar to my video on pleating char siu pau. I love it when you add "they will not keep long" - because I know in my house they'd be lucky to cool down before they get eaten! WOW. This looks supremely good. I am in awe. That is beautiful! I've never heard of Mooncakes! Sorry..its me again..but what does "Dunk the mooncake in 3 times in very hot oil." means? put the mooncake into the hot oil and take it out immediately then put it in again and repeat 3 times? Yes, take the mooncake in and out of the hot oil 3 times in quick succession, and then leave it in the hot oil to cook until golden. When you do it, you will see what is happening to the mooncake. anyway can i omit the golden syrup? There is no golden syrup in this recipe. Would love to try my hands on these. can this mooncake be baked instead? I have never tried baking this mooncake. If you do bake them, can you let me know the outcome ? Thanks. Wow, that's a lot of work, but I guess it's worth it because it turned out beautifully! I've made them. I'm using aunty yochana's recipe and bake at 175C till golden brown. My first tray comes out ok but i think i baked more than 1/2 hour. My second tray i use 200C. One of my pastry books stated 200C and confirm this with my aunty who also said using 200C. Baking is more healthier than deep-frying. Where might I find a Savory Mung Bean filling recipe? Basically it is mung beans, fried onions, sugar, pepper, salt. Wow this looks like a thick and delicious croissant! Love your blog name and the site! Thanks for sharing this deliciousness. i just tried this for the first time and they came out ok - i'm curious, how large are the cakes in your photos? The mooncake are not very big. Quite a while since I made them. If you are able give me some measurement of the height and base of yours, I might be in a better position to indicate the size. Glad it turned out ok.
All rights reserved. No photos or content may be reproduced without prior written consent. Comments are most welcome. However, please do identify yourself as 'nameless' comments will no longer be published. While you are here, do feel free to 'check-out' the ads. Thank you and welcome to our blog. The images in this blog are the exclusive rights of Sinner. Please do not copy or upload any photographs located in this blog in any medium to anyone without written permission .